We launched the patented Lamzac® the Original in 2016, and it became an overnight sensation across the globe. Since the launch, we've been hard at work finding ways to improve the already amazing product. Lamzac® the Original 2.0 is the new and improved version of our world-famous lounge chair. This new collection features a single opening for quick inflation, and screw-in plastic stake to keep your Lamzac® secure. Lamzac is a comfortable seat or sofa for two that you can fill with air within seconds using our unique filling technique. While the Lamzac is large and comfy when you use it, it is easily deflated and stored in a small package allowing you to take it anywhere you want! As a result the Lamzac is the perfect buddy for all your outdoor activities such as travelling, festivals, beach trips, hanging out in the park and much more. Meanwhile the lightweight but strong and durable fabric will ensure that you can use Lamzac® the original over and over again. Be prepared to get loads of attention when using our fabulous lounge chair! Single opening for easy inflation - inflates in seconds – really! 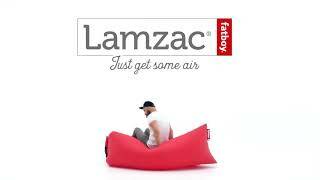 The Lamzac is a comfortable seat or sofa for two that you can fill with air within seconds using our unique filling technique. While the Lamzac® is large and comfy when you use it, it is easily deflated and stored in a small package allowing you to take it anywhere you want! As a result the Lamzac® is the perfect buddy for all your outdoor activities such as travelling, festivals, beach trips, hanging out in the park and much more.